At the site of the 9/11 memorial, a forum is being held called, "9/11 Conspiracy Theories: Why They Exist and What Role They Play in Society." 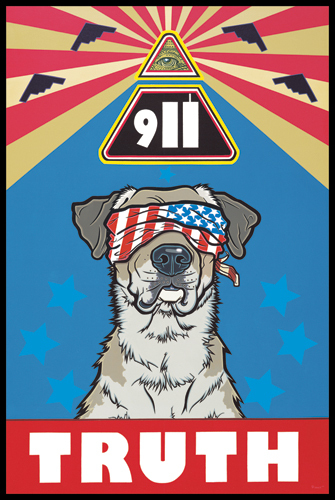 "Professors Kathryn Olmsted and Michael Barkun address broader questions of why conspiracy theories exist and how they should be viewed in the context of post-9/11 communities. Both have written books on the subject and will discuss the psychological underpinnings of these theories, their historical roles in shaping public opinion and how we should view or evaluate their relevance today". Here's a video of Prof. Olmsted talking about her book on Conspiracy's. Cass Sunstein, a Harvard Law Professor and Confidant of Obama was appointed to be Obama's head of the Office of Information and Regulatory Affairs. He became infamous within this movement for writing a paper on how to best to combat "Government Conspiracy Theory Groups," including by covert infiltration, as described by Glen Greenwald. And now rumor has it that he's on a short list to replace John Paul Stevens on the US Supreme Court. That's great - Eh? A real Constitutionalist there who will stand up for the Bill of Rights, including dissent and free speech. He would be a shoe in for confirmation - what with his Neocon, Big Brother Street Cred with Republicans and Obama's support. If Obama nominates this guy it will be one more in a long list of Obama sell-outs to the Security State. On Sunday, March 30th, 2008 a show on blog talk radio a show called was covering a street action in jersey city. Many activists were interviewed cause it was a special last Sunday of the month street action. Live on the air Glenn and Eric spoke about many key issue on 9/11. This show was deleted from the Blogtalkradio server. Blogtalkradio.com is actively censoring shows about 9/11 truth. In an email from John C Sweet Director Customer Relations Host Liaison Director he said that "We have deleted the listed segment above from our servers as we deem 9/11 conspiracy content/truthers to be misrepresentative, slanderous and libelous." New York, December 10, 2007—The Committee to Protect Journalists is concerned about a criminal investigation launched by French authorities against Guillaume Dasquié, a reporter for the daily Le Monde, on accusations of publishing state secrets related to the 9/11 hijackings. Officers from the Directorate of Territorial Security, a counterespionage agency, searched Dasquié’s Paris home on Wednesday. They detained him for 48 hours, during which time he was interrogated and pressured to reveal his sources, according to international news reports. Dasquié faces five years in prison and a fine of 75,000 euros (US$110,000) under Article 413-11 of France’s penal code if convicted. Google has just reset my views on both of my films. The 9/11 responder film had received at least 1147 views, up till yesterday. And my other film had 688 views or so. They are both down to a count of less than 50. Contact Google and tell them to stop censoring, or we are all in trouble. If you can't join them, BEAT Them!! about a week and a half ago i was banned on digg.com and then a few days later i saw someone from BuzzFlash.net crawl my whole site and strangely enough i was banned there too. LOL digg.com is for nerds worrying about playstations and when the next star wars sequel is coming out so they can wear their jedi costumes. Buzzflash.net is for "progressives" that want to bash bush but don't dare bring up govt complicity about 9/11. Anyways, i decided we need a interactive site like digg for the truth movement, somewhere we don't have to worry about censorship of the truth. So i started RatTazer.com and invite all to help me get it started. after a simple registration one can vote (tazer) stories they think are the best and also submit stories they think need to get out to the rest of the community. this is not to replace great sites like 911blogger but to assist them. I encourage people to link this site's stories to RatTazer and help build their traffic. My site is not for a visitor to come to read or watch videos but only to find the best of the best news stories of the day and be directed directly to the other site to "consume" that sites news.